I took The Dangerous Book for Boys off the shelf this afternoon and started browsing through it. I would have loved having this book when I was a kid. It is full of exactly the kinds of things that would have fascinated me: stories of adventure and battle, explanations of how to do things like tying knots and building things and how to fish, useful information about grammar and astronomy and weather, and less useful things like Navaho code talking, and on and on. It's great for browsing. There is a Daring Book for Girls, too, but I don't have a copy of that. Today I came across pages describing "Five Pen and Paper Games" one of which I remember playing although I think it was mostly played on the blackboard rather than on paper. That game, the first one explained, was "Hangman." THIS IS THE CLASSIC word game for two or more players. Think of a word and mark out the number of letters in dashes _ _ _ _ _ _ _. The other player guesses letters one at a time. If they guess correctly, write the letter. 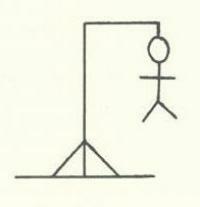 If they get one wrong, draw a line of the hanged man and write the letter on the page. Incorrect guesses of the whole word also cost a line. There are twelve chances to get the word right. If the hanged man is completely finished, they lose. Take turns and try some really hard words, like "paella," or "phlegm."